Since his directorial debut in 2013, Ryan Coogler has been on a roll. With only three feature films under his belt, he has successfully transitioned from independent cinema to crowd-pleasing blockbusters, with the incredibly successful Black Panther released at the start of this year. However, scheduling conflicts to the Marvel hit meant that he had to take a step back from directing Creed II, the much-anticipated sequel to his 2015 sports drama. With The Land director Steven Caple, Jr. in the driving seat, Creed II sees Adonis Creed (Michael B. Jordan) face off against Viktor Drago (Florian Munteanu), the son of Ivan Drago (Dolph Lundgren) – the boxer who killed his father in the ring 33 years ago. When the son of Apollo Creed came back onto the scene in 2015, it is almost no surprise that Ivan Drago would somehow be involved in his narrative. The latter is arguably the opponent that ultimately broke Rocky – defeating Creed in the ring and his lack of remorse over causing his death pushed Rocky to the limit and his eventual victory. 33 years on, their mutual animosity is evidently still raw and Drago drills this hatred into his son to mould him into what he was: an intimidating fighting machine. Although Ivan is embittered over the loss of his former glory, Victor is emotionally pummelled by his father and feels the pressure to not only restore his family’s reputation but see himself worthy in his parents’ eyes. Donnie is similarly torn about his opponent. Tethering a fine line between redemption and revenge, his initial drive against Viktor barely conceals his bravado as a fighter, which fundamentally backfires. Conveying a wide range of emotions, his journey reminds the audience of his compassion and determination, which make him such an endearing protagonist. However, Jordan delivers another impressive performance that transcends past his physicality on the screen. Though not as raw as its predecessor, Creed II allows him to further develop his character without the pressure of carrying the future series on his shoulders, and with his amazing chemistry with Stallone and Thompson, he continues to be one of the charismatic actors in modern cinema. In terms of the supporting cast, Munteanu lets his physicality do all the talking while Thompson is given a more multifaceted role as Donnie’s girlfriend Bianca. Stallone’s Rocky continues to be a constant as he reluctantly finds himself confronting old demons, while Lundgren is a lot more talkative than his previous performance. 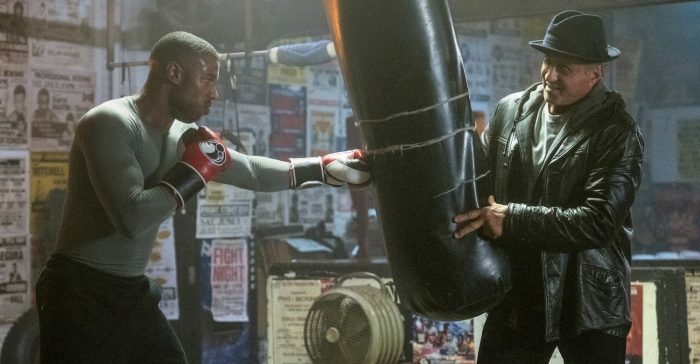 Without Coogler involved in the direction or screenplay, Creed II doesn’t feel like a worthy follow-up. For the most part, Caple Jr.’s direction, not to mention Stallone and Juel Taylor’s screenplay, lack attention to detail and doesn’t take the care to elevate this past a conventional sports drama. But Kramer Morgenthau’s smart cinematography saves the story by highlighting the relationships between the characters. This ensures that Donnie’s emotional development – not just with his friends and family, but also Rocky and his late father – remains integral to the narrative. Along with Ludwig Göransson’s thumping soundtrack, it is hard not to root for young Adonis Creed – by the time the climactic fight takes place, you’ll be cheering him on. Overall, Creed II falls short of its predecessor – but that doesn’t stop Michael B. Jordan owning the screen. Creed II is out in UK cinemas on 30 November.